CC Capsule: Dennis F2 Water Tender – Still Or Sparkling? I have a confession to make: I do not care for trucks. They’re not vehicles I can relate to. Consequently, I don’t know the makes all that well, nor the engines or anything else about them, really. And the vast majority of them are ugly to me (they’re not designed to be attractive anyways). But there are always exceptions to the rules, especially if they’re my rules. I saw this fire engine parked outside a small firehouse in Mandalay, as my family and I walked around town. I live in Rangoon, Burma (now known as Yangon, Myanmar) and was in Mandalay on a week-end trip. This truck really broke my rules: it was still in use (not parked there the previous day), obviously ancient, kind of attractive and – miracle of miracles – not a Japanese or Chinese make. Even I knew Dennis was a British company. Few British vehicles are to be found in Myanmar nowadays – let alone fire engines. So here’s a précis of what I could gather about this truck and its maker: Dennis Bros. of Guildford started making cars in 1901, trucks in 1904 and fire engines in 1908. They dropped cars altogether by 1914 and focused on trucks, fire engines and buses, as well as other products, such as lawn mowers. Dennis pulled out of the bus business in 1967. Dennis soon had 50% of the British fire engine market. The F-series were launched in 1946 and made in various sizes and denominations until the early ‘70s. 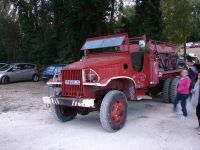 The F2 was one of the earliest large F-series designs and seems to have been produced from 1948 to about 1962. Later Dennis models included the D-series in the ’70s and the DS in the ’80s. 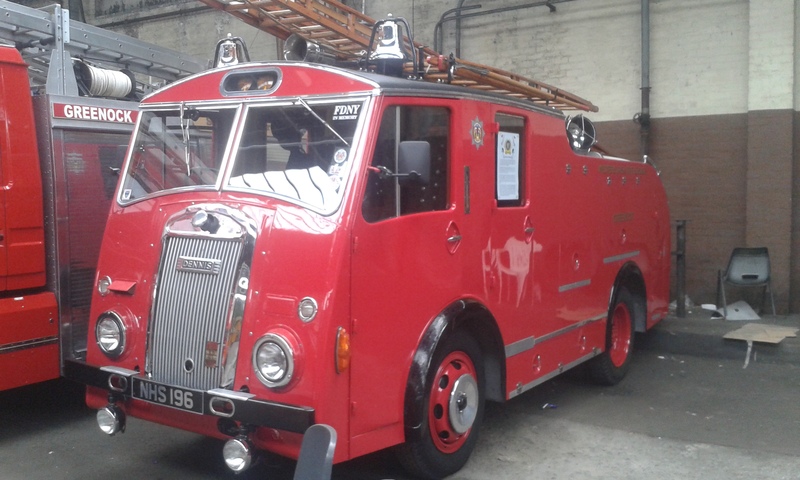 In Britain, many Dennis fire engines are still in operation, as the company still made them until about ten years ago. Currently, the marque is owned by Dennis Alexander Ltd. (ADL), a merger of the Dennis, Alexander and Plaxton companies. Dennis are no longer in the fire engine and truck business though, as ADL are focused on buses only. As I took pictures of this truck under the noonday sun, I noted the small “8” embossed and painted on the side of the hood. This seems to be a reference to the F2’s engine, the iconic Rolls-Royce B80 straight-eight. Rolls-Royce launched the B-series right after the war to power civilian and military vehicles. There were four F-head gasoline engines: the B40 (4-cyl. ), B60 (6-cyl. ), B80 and B81 (8-cyl.). The eights came in two sizes: the B80, as fitted in the Dennis F2, was 5675cc (165bhp @ 3750rpm) and shared the same 88.9 x 114.3mm bore and stroke (3.5’’ x 4.5’’) as the B40 and B60. The B81 was larger at 6515cc, providing 195bhp and more usually found in armoured or earth-moving equipment. The only two-door Phantom IV, made by H.J. Mulliner to the Shah of Iran’s specifications in 1951. The B80 was used by Rolls in their most exclusive post-war car ever, the Phantom IV – only 18 made between 1950 and 1956. Clients included the Windsors, the Emir of Kuwait, the King of Iraq and General Franco (before he was “still dead”). Does the Burmese Dennis still use the same engine as the Generalissimo’s phaeton? It’s not impossible. These engines are pretty bullet-proof. However, Burmese isolationism – which only just started to fade away – may have forced the Mandalay Fire Dept. to transplant a Hino, Nissan or (horror of horrors) FAW Diesel into this F2 to keep it going. Here’s a similar F2 found on the interweb, located in nearby Malaysia. This one looks like it’s not seen action for a while. Our Burmese Dennis, on the other hand, remains on call. I screwed up the picture of the cabin (photography is not my strong suit), but can report that the seats are now a wooden bench (teak?) and some of the dials appeared to be originals. Running water is not so widespread in this country, so I imagine this old gal is used as a cistern when a fire breaks out in those parts of Mandalay that are underserved, likely with a more modern pump truck. Voilà! This was the first installment of my Weird things in strange places series, where I strive to overcome my photographic shortcomings to bring to CC some of the more unusual vehicles I see in my daily life here in Asia. The low floor cab Elite was originally launched about 20 odd years ago while they were still part of the ‘old’ Dennis. The bodies for the fire engines had been made in Guildford by John Dennis Coachworks which was spun off from Dennis in 1985, though they still built them on Dennis chassis until production was stopped in 2007. Usually Scania or Mercedes chassis are used now. They use Dennis rubbish trucks here – the only Dennis trucks I’ve seen for decades. Great find – this made me smile. I hope they’ve managed to keep that straight-eight running, that would be some achievement! We still have little Dennis Dart single deckers running around, which are circa-2005 models so I don’t think they got out of buses in 1967, but maybe I’m confused by the fragmentation of the company. I used to find it amusing that the Dart used the same Cummins diesel as Dodge pickups. AFAIK Alexander Dennis still have the Dennis plant in Guildford, but only producing chassis. Dennis refuse trucks/bin lorries/dustcarts/whatevers are very common, and I assume still in production, but that is Dennis Eagle, which is a separate company. Here’s a nice Dennis at Bridgeton Bus Garage in Glasgow. So I guess I made my slightly less informed post at the same time as Bernard. D’oh. A large version of the B80 engine was used in the Scalded Cat Bentley prototype that so impressed the Duke of Edinburgh, it was one of the reasons R-R earned the Royal imprimatur (Lady Docker’s inappropriate ostentations being another). Apparently the Windsors’ Phantom IV was specified with an adjustable front seat so that a certain tall royal who loved driving could take it for a squirt around their substantial properties (and away from public eyes of course). Burma. I think we met a while back on CC when things were slightly different there and you mentioned trouble with internet access. Given your prolific output, it would seem things have improved. Things have improved internet-wise and power-wise too, since we moved to a place that has a generator. I’ve been reading your previous posts from 2014-15, btw. It would be inconvenient for me to write a gushing comment at the end of each of them, so I’ll gush right here. Incredible reads, all of them. And the illustrations are superb, too. Noted you have used a few movie stills in some of them (The Party for the ‘Chinese Eye’ Rolls-Royce and The French Connection for the Lincoln MkIII, if i’m not mistaken.) Great idea, that! Thanks for the compliment, but your game is already up enough. Just keep them coming. Please. Thank you for teaching me about a truck brand that I wasn’t aware of existing. It’s history is rather compelling and with this one being so far from where it was produced is simply icing on the cake. Don’t worry about your photography. With the obstacles in the way like they were, you definitely made the best of it. I know a few truck makes, even British, but never Dennis. First impression: it looks like a squared-off Mack B series. I love obscure old trucks, and you have found a really cool one, so thanks for bringing it. Your photography skills will improve with practice, but will do quite nicely as they are. You had me at “Dennis”. An intriguing find and great write-up. I have never heard of this marque before today… It’s a shame they are no longer building trucks. But the Mandalay authorities now know where to send the parking fines! Never fear, as Bernard pointed out, you can get a Dennis garbage truck (if you happen to need one). A Trucky McTruck Face, if I ever saw one. Looks like a B-61 Mack caricature. Reminded me of a 60’s Dodge LCF at first. I knew of Dennis’ existence from photos, but I knew very little about them. How very fascinating to find this piece of British history in Myanmar of all places, and how very impressive that it’s still in service today! THANK YOU for sharing this unique old truck . I look forward to more interesting and unusual finds . Sweet old truck. And where else would one find one still at work? There was a Dennis fire truck in the local volunteer brigade when I was a kid, It was reputed to be the oldest working model in the country at the time and was donated to MOTAT upon replacement who left it out side where it rotted away, I seen it again about 10 years ago, a terrible waste. Great spot Tatra87. I guess this is used as a water carrier now, possibly to areas of Mandalay that do not have (reliable) access to drinking water? Dennis was indeed a great builder of fire engines, dust carts and the like until the 1980s as well as bus chassis. Now, as you say, part of Alexander Dennis where the “Heritage Dennis” element builds the chassis and “Heritage Alexander” builds the bodies. Plaxton builds the coach bodies, as it has done for over 80 years +. Interestingly, Alexander Dennis is owned by the same interests that control the vast Stagecoach Bus, Coach and Train business, which includes Coach USA, which is an interesting case of vertical integration. Rolls-Royce had a strong history in road going and armoured vehicle diesel engines, into the 1980s, when that part of business was sold to Perkins, part of Caterpillar. And it reminds me of this French registered fire engine I saw last summer. Very enjoyable post – and great find. I’m sure there are many more “weird things” waiting to be spotted there in Myanmar. Looking forward to future posts. Dennis is a new name to me as well. Thanks for the informative post and photos! Trying to collect as many pics as I can to do a 3-part series of multiple CCs, which I plan to divide into modern road cockroaches / older interesting oddities / bus, trucks and other. …Why they invented Motocycles Good Sir . =8-) . We’ve got one of these old Dennis fire trucks in Barbados too – one of our local car enthusiasts restored one many years ago and it still shows up at an annual parade of classic vehicles at one of our festivals – it carries the vanity plate “FIRE 1”, which refers to having a drink of rum!